At some point every broker and agent in America is going to consider WordPress Real Estate Themes for their website. It’s inevitable. We discussed why in earlier articles. WordPress is one of the best, if not the best content management system in the world. More businesses use a WordPress platform than any other. To start, you are going to need choose a “theme” or format for your website. For real estate, obviously look at WordPress Real Estate Themes first. It’s critically important you consider these issues. Do it Yourself or Go Pro – WordPress is known as a user-friendly platform for bloggers. In fact it was created specifically to make blogging very easy. The blog platform became so famous and popular, that the creators of WordPress decided to create a full-on website platform for businesses. Great, one might think, I’ll choose a WordPress Real Estate Theme and do it myself, or have that techie down the street put one together for me. Creating a website for brokers and agents is a bit more complicated because there are many intricate parts that make need to be addressed. 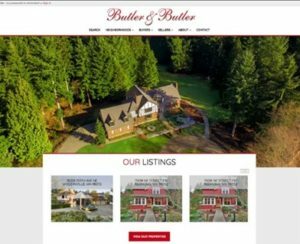 When you are counting on your website to generate leads for half-million dollars homes and you are displaying listings for million dollar homes, you can’t afford to go cheap. Don’t adapt a free or cheap theme and think it will work to display listings, etc. Because there are IDX and integration issues with the local MLS, a local WordPress company that creates local websites for plumbers and hair salons is probably not the best choice to help you. Adapting themes will take you longer than you think. And probably cost you twice as much. Go with the pros like Home Junction who specialize in creating WordPress real estate websites. We’re going to tell you why. WordPress Real Estate Themes – Home Junction has created themes specifically for the needs of brokers and agents. That means those themes have pages already built for listings, lead forms, market data, photo galleries, etc. You don’t want to spend time and money rewriting code to make a theme fit your needs. Using existing WordPress Real Estate Themes from a reputable company also allows you to quickly customize that site for your logo, brand colors, about us page, agent roster, etc. In addition, you will want a theme that is SEO-friendly. Google and Bing love the basic WordPress structure. It’s easy for them to scan with their bots and index in their rankings. However, to rank high in your particular marketplace, you will need to add specific keywords and content for your target market. You don’t want a theme that is clunky and doesn’t help you maximize those SEO efforts. That in itself will take some time. So it’s smarter to go with ready-made WordPress Real Estate Themes out of the box. WordPress Real Estate Plugins – here’s another major, major point you need to know. Your WordPress website is going to need plugins. Plugins are a great feature of WordPress. There are thousands of them out there that can help you add features such as lead forms, photos galleries, etc. But that’s also a problem with WordPress Real Estate Plugins. There are so many of them, it’s hard to tell which one to choose. You can waste a lot of time inserting, deleting and testing plugins. Home Junction has created their own WordPress Real Estate Plugins. You need someone who knows the real estate business to truly supply you with the right software. For example, a broker will want an IDX to pull in MLS listings. You certainly need a reliable company to set that up for you and knows how to integrate the specific critera for each MLS. Home Junction also has an assortment of other real-estate related plugins – real estate market data, school data, recent sales activity, home price trends, etc. Another powerful plugin is their home value estimator tool which is a magnet for lead generation. (Home Junction is also one of the leading real estate data aggregators in the country. That’s very, very handy. With a hyper-local real estate data API a broker or agent can display massive amounts of relevant data, such as recent home sales, that instantly makes them the local broker with the most local knowledge). For brokers or agents, the answer is easy. Of course it does! More and more consumers use their mobile phones and tablets to search the web. Even Google is noticing this trend as they analyze the billions of data points they see every day. In the US, Google now says 58% of searches are done on mobile devices. All indications point to mobile becoming more and more popular. Home buyers are going to scan their phones on a regular, if not daily basis, when looking for a home. This is how the Millennial generation searches the web. Your website must adapt to whatever devices – iPhone, Samsung, HTC, they are using, and whatever version they are using and the software on that device. It’s complicated. WordPress is very adaptable but you need a qualified developer who can make the necessary adjustments so that consumers can see your website on any device. That means navigation, text, images, videos, etc. all must adapt to that device. Google and Bing have ways of checking this and if your website is not mobile-ready, then frankly the search engines are not going to list you high in their mobile search engine rankings, even if you rank high on desktop versions. Technical Support – a blog website is easy to manage. A business website is a different story. Be sure you find a WordPress real estate theme where you can get technical support. Just one piece of code in the wrong place can cause problems. You don’t want issues when someone is searching on your website for a $1 million dollar property. A glitch here or a delay there and they are gone. While there are thousands of themes available on WordPress, support can be thin. Some companies might have even gone out of business. That means there won’t be any updates for that theme – which is super critical for security as threats are constantly changing and adapting. Secondly, as a real estate professional, you are going to want to make additions and changes to your website. Maybe you want to customize some section of your website. New WordPress real estate plugins are constantly being developed. You will need technical support to help you implement those changes and ensure they work correctly. Bottom line: WordPress is an amazing platform. It’s the perfect platform for brokers and agents because there are some ready-to-go, off-the-shelf WordPress Real Estate themes available. Do the legwork on WordPress Real Estate Themes now (or just call Home Junction) to avoid tremendous headaches later.